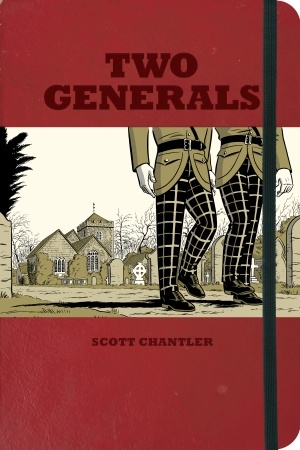 Two Generals — Scott Chantler’s excellent graphic novel translation of his grandfather’s war journal (published by McClelland & Stewart), is definitely one of the better books to come out this year by a Canadian cartoonist, and now that it is widely available in bookstores and comic book specialty stores, today would be a perfect day to reflect on the the book and it’s topic – remembering the Canadian veterans that fought in the first Two World Wars. Two Generals is a WW2 book – looking at the actions of Scott’s grandfather and infantry leading up to and following the allied invasion of Normandy on June 6, 1944. It is not a political book, but a translation of one man’s personal experiences. We were a wee bit apprehensive about what Guelph’s Scott Chantler would do with his attempt to present World War II and his own family history through a graphic treatment. A comic book as a lens for such a sombre, sensitive subject? As evidenced by his previous Northwest Passage, a serious multi-volume history set in colonial Canada, we should have known better. Chantler’s Two Generals (McClelland & Stewart, 144 pages, $27.99) is our top pick this Remembrance Day, not for its novel mix of format and subject but for its stunning success in bringing home the real foot soldier’s experience of those awful days. Additionally, The Beguiling’s Chris Butcher submitted a generally positive special review of the book to the National Post which ran last Friday. Finally, the website iFanboy gives a very positive review of the book. Upcoming appearances by Chantler have been posted earlier on this website — he’ll be at Guelph’s the Dragon this Saturday, November 13 for a signing and a children’s art class, and he’ll be at the upcoming Toronto ComiCON at the Metro Toronto Convention Centre on Sunday, November 21. This entry was posted in 2010 Releases, Media, Newspaper articles by Kevin A. Boyd. Bookmark the permalink.